This is a 1500 sf all season home located across from Anyela's Winery on the West Side of Skaneateles Lake. 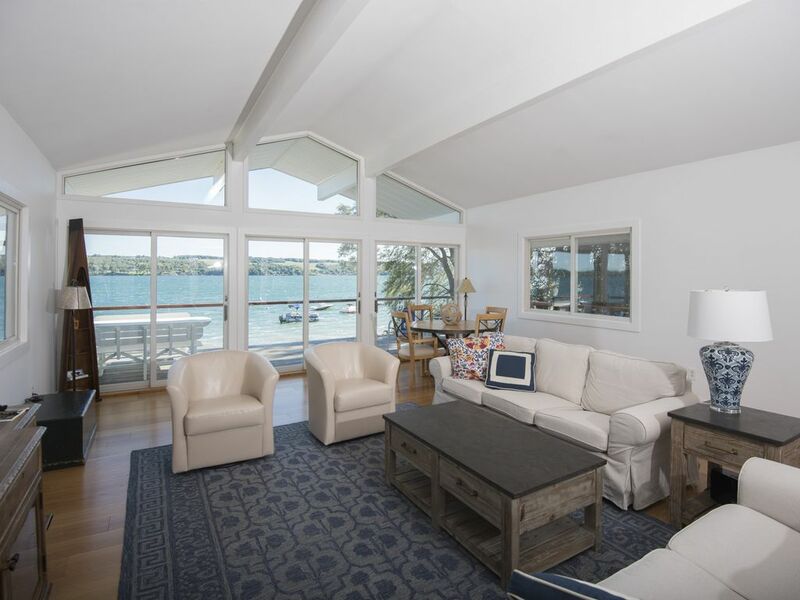 The house and large deck are located close to the water's edge on a westernmost point south of the Skaneateles Country Club. This property has lake views from the North to the South end of the Lake. Enjoy the level lakefront beach and dock. Interior remodeling work and new furnishings were completed in June 2016. We are longtime residents of Skaneateles and truly appreciate this great community and stunning lake. We own two other vacation rentals in Cape Cod MA and enjoy sharing these properties with others. This is a great house in an exceptional location. Since Skaneateles Lake is a glacial lake much of the shore has a steep drop to the water. This house has a small cove and level beach great for sunbathing and wading. This house was perfect because of the location, the cleanliness, the view, the space, and even more. The house was perfect for a relaxing weekend with friends and I would highly suggest it for any occasion! Highly recommend. Gorgeous home right on the lake, very comfortable. Our stay here was beyond our expectations. All the comforts of home. To get up each morning and have our coffee overlooking the beautiful lake was so relaxing. The Owner was a delight to work with. We had a hard time leaving! Hopefully will be back for another stay. Thank you Anne! Highly recommend, beautiful house, great location and property owners were fantastic to deal with.. The property is wonderful and Anne couldn’t be more accommodating! Definitely a 5 star!! Anne and David are the ultimate hosts! The house is just perfect. We stayed the weekend to enjoy the holiday festivities and we felt at home from the start. What a treasure.... we will definitely be back! Our stay November 8th - 11th at Anne's home was wonderful! We are from Long Island and we met our friends of 35 years who live in Canada for a weekend visit. The house is so comfortable and relaxing we had a great time together. Everything went smoothly from before we arrived until we left. We would definitely stay at the house again, we loved it!